over thirty years, one of the best kept secrets in providing cures for cancers like leukemia & lymphoma and for diseases like sickle cell anemia has been bone marrow donation and transplantation. In 1987, a federal mandate created the National Marrow Donor Program. The program had a simple goal: connecting volunteer donors with patients whose only chance for a cure was a bone marrow transplant. 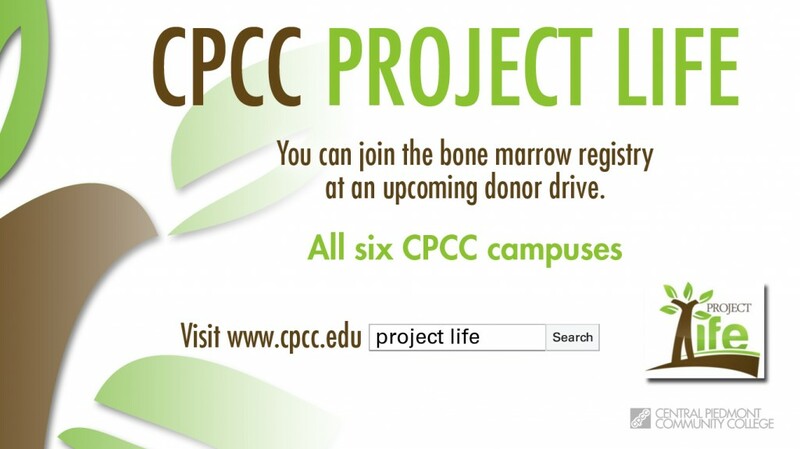 Project Life is partnering with Central Piedmont Community College for the fourth year to educate students, faculty and staff at CPCC about serving as a bone marrow donor. The year’s goal is to recruit 600 potential new donors who will be added to the National Bone Marrow Registry List. Click here to read more about Project Life. Since then, thousands of individuals have participated, and the program has grown to include 10 other college campuses in North Carolina. CPCC is proud to be included among these higher education institutions and house the first active Project Life chapter in the Charlotte metro area. The Cytotechnology Student Association, the Student Government Association, and Phi Theta Kappa Honorary Fraternity are all partnering with Student Life & Service-Learning to support this initiative. We would love to have you come out and be a part of the Movement and help save a life! Please contact Jenn Marts, Central Campus Service-Learning Coordinator, for more details (Jenn.Marts@cpcc.edu), for more information or to join us at one of our upcoming Project Life events! We hope you decide to be a potential donor or Project Life Volunteer! Both days 9 a.m. -4 p.m.
Project Life: What’s Your Type? Join student leaders from the health science programs in getting “typed” at one of the bone barrow donor drives being held at Central and Levine Campuses next week. To learn more about Project Life and how you can make a difference, please click here.